Perfect for backyard cookouts with the family, the Louisiana Grills LG700 series pellet grill delivers world class BBQ. This versatile wood pellet grill offers the capability to bake, roast, braise, smoke, grill, sear, char-grill and BBQ with ease on your backyard patio. The grill is constructed from heavy-duty, powder-coated 14 gauge steel for enduring durability. The LG700 main level cooking grate features 497 square inches of space while the upper rack offers 210 square inches for a comprehensive total of 707 square inches. With the large stainless steel burn grate installed in the burn pot and the flame broiler in the open position, you can reach temperatures up to 600 degrees for fast and fiery grilling. Fan-forced convection cooking ensures even temperatures throughout the grilling area and a proprietary exhaust system allows for even smoking. The auto-start electric igniter and feed system lets you set your temperature, push start, sit back and relax. The natural wood pellets feed into the burn pot where they are automatically ignited and the fan-cooled hopper and feed system keeps your grill at the temperature of your choosing. The hopper features a capacity of 14 pounds. The Digital Control Center lets you set your desired temperature and automatically maintains it during the grilling process. With the included food probe, you can set you desired food temperature and the grill will automatically go into smoke mode when that temperature is reached, preventing over cooking. The lid thermometer enables you to monitor the temperature inside the grill and the grease bucket catches run off grease from the flavor guard. The vented grill handle stays cool even when the grill is cooking at high temperatures The LG700 cart has a solid bottom shelf for storage and also features heavy-duty casters for easy mobility. First time with a pellet BBQ and so regret buying a Lousiana Grill. Temperatures ranged from ambient to 650 all in the same steak. No control. Ended up with a bonfire in it, but the worse part was dealing with their customer support - an oxymoron cause there's no support at all. Made nearly a dozen callls and they throw parts at it with no resolution and me doing all the work. I was told that a 2 foot flame that nearly singed my face was normal or my fault. They refuse to replace their defective BBQ and will not send a service rep to fix it. Too bad, cause the few time it actually was consistent produced a great steak. Unfortunately, I've burnt more than a new BBQ would have cost me. Not going to take a chance burning my deck down. Not to mention the finish didnt last 6 months. Never again. If you're shopping for a pellet I'd go with Traeger. We appreciate your comments on the Louisiana Grills LG700 Wood Pellet Grill. We could not locate your order with us, but would like to speak with you about the issues you are having so we can help troubleshoot them. Please call us at 877-743-2269 and we will be happy to look into this further. Louisiana Grills LG Series offer a classic barrel smoker design with valuable cooking space, solid construction, and a wide range of versatility that allows you to bake, roast, braise, smoke, grill, sear, char-grill and BBQ with ease. Louisiana LG Pellet Grills hold up to 14 pounds of pellets and produce a wide temperature range of 180 degrees to over 600 degrees. The grill features an adjustable direct flame broiler when in the open position, keep it closed for low and slow cooking. However, one of the plates features an adjustable broiler grid, allowing the fire to rise to the grilling surface for flame kissed broiling. The Digital Control Center lets you set your desired temperature and automatically maintains it during the grilling process. With the included food probe, you can set you desired food temperature and the grill will automatically go into smoke mode when that temperature is reached, to prevent over cooking. The lid thermometer enables you to monitor the temperature inside the grill and the grease bucket catches run off grease from the flavor guard. The Louisiana Grills LG series demonstrates the ease and precision of cooking with pellet grills and is a solid choice without having to break the bank. 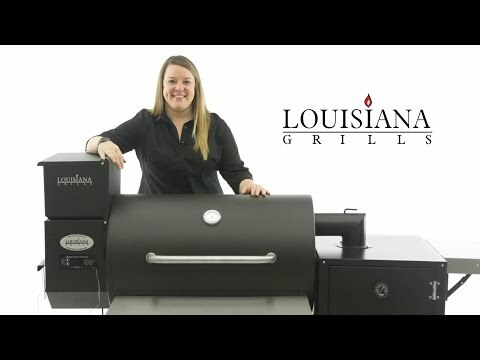 Louisiana LG Series Pellet Grills have a smaller hopper capacity than similar grills which means you'll have to refill the hopper for longer smokes. You want best bang for the buck. We've given this pellet grill a 5 star rating in value because at its price it's got the highest temperature, biggest cooking space, and the best warranty. 25 1/2 X 19 1/2" 30 X 19" 30 X 19" 30 X 19"